Injury, illness, and aging can all cause us to be confined to our homes. In any case, we can make the most of our time spent at home. After all, we’re surrounded by comforts, the food we love, a couch to read a favorite book, a cozy bed. Plus, for some of us, we can take comfort in having a pet. A furry or feathered companion can work wonders to keep us companion while we’re homebound. If you don’t have a furry friend around the house, now may be the perfect time to get one. The benefits of furry friend are numerous! A new pet can be an enlightening change for your home. When things are quiet, a pet can keep you content and occupied. Animals are delightfully social, and when you adopt a pet, it’ll become a loyal companion. There’s so much to do with your new companion. You can watch the birds, curl up and cuddle, play with a favorite toy, or just take a nap in the sun. Animals are outright fun, full of entertainment, and they motivate us to be active. Pets actually provide us with some health benefits. Alongside reducing anxiety and stress, having an animal in your life can help to reduce pain, lower cholesterol, improve immunity, and lower blood pressure. Plus, having a pet around the house may reduce the risk of stroke. You can read more about the studies behind these claims from Woman’s Day’s article, 10 Health Benefits of Owning a Pet. Take note, if you’re considering adopting an animal, it’s important to be sure that you can care for it. Pets are expensive, and they require consistent care and attention. That said, the benefits of owning an animal usually far outweigh the costs. If you can’t adopt an animal full time, be sure to ask a friend or family member to bring over their “best friend” for some social time! 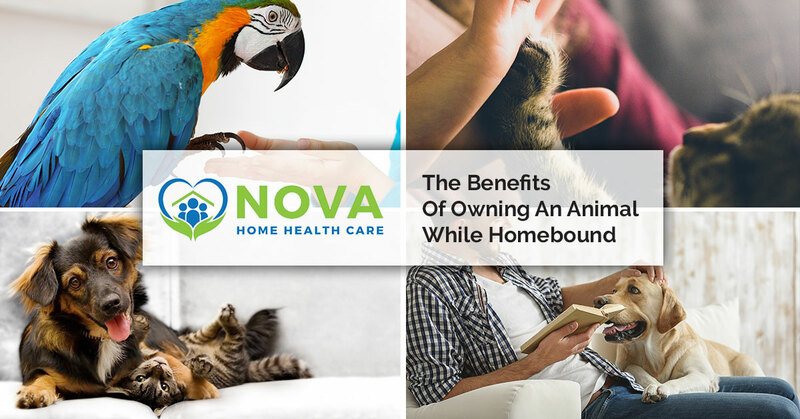 Here at Nova Home Health Care, we provide help when you need it, and help where you desire: at your home! If you’re homebound, for whatever reason, we’re here to provide you with the care, therapy, and solutions you need to live a comfortable day to day. We provide a variety of services, including physical therapy, occupational therapy, dietitian services, speech therapy, elderly care, and more. Count on our staff of caretakers and skilled nurses for your needs. Learn more about our individual home health care services, and get in touch with our home health care agency to get started! Nova HHC provides in-home care services for folks throughout Fairfax, Alexandria, and Arlington.